I am well aware that there are approximately a million versions of these delightful biscuits roaming around online. However, when my friend Lesli emailed me to tell me she had “rocked it” with the cheddar biscuit and did I want the recipe…how could I say no? I was sure they would excel above the other versions I had tried before. And they absolutely did. Which should be no surprise since Lesli is an amazing cook and I should know to trust her judgment completely when she’s rocked anything in the kitchen. 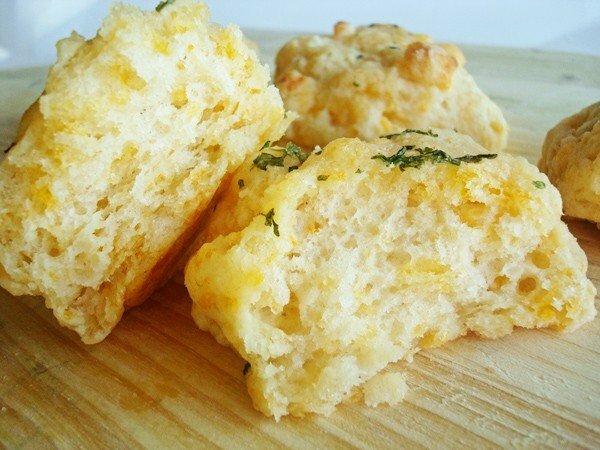 Light and tender, cheesy and buttery, these drop biscuits are a breeze to make and nearly melt in your mouth. A perfect compliment to a light, spring dinner. Preheat oven to 425 degrees. In a medium bowl, combine flour, baking powder, garlic powder and salt. Cut in shortening and butter until coarse crumbs are formed. Lightly mix in grated cheese. Mix in buttermilk just until moist (dry spots here and there are ok – the biscuits will be tough if they are overmixed). Drop the biscuits onto a greased or lined baking sheet. Bake for 12-14 minutes, until browned and golden. 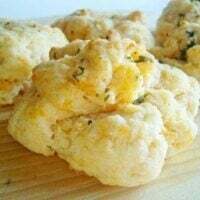 While the biscuits are baking, in a small bowl combine three tablespoons melted butter, 1/4 teaspoon dried parsley flakes, 3/4 teaspoon garlic powder and a pinch of salt. Right when the biscuits come out of the oven, brush the butter/herb mixture over the biscuits evenly (alternately, you can dip the top of the biscuit into the butter mixture). Serve immediately. Recipe Source: slightly adapted from Lesli D.
These were amazingly yummy. I’m sure my garlic breath will knock people over at church tomorrow because I ate three, but I don’t care. I did use coconut oil instead of shortening because I never buy shortening. My husband said I get a baking gold star. Thanks, Mel! Made these for dinner tonight and LOVED them. I even missed the part about brushing them w/ the garlic-herb butter at the end, so totally left that off, and they were still fabulous. I subbed plain yogurt for buttermilk since I live in Japan and can’t get it. Worked beautifully! Also used all butter since I had no shortening. So light and perfectly flavored. Thanks for another great recipe, Mel! These may just be thbe best biscuits ever and one of my favorite things of Mel’s. I’d recommend a light brush of butter, don’t go crazy and these are awesome served with beef stew! I have never made biscuits before. These came out great. They had really good flavor. They were not very browned on top at the end of baking so I put turned the broiler on for about a minute.They were very soft and tender on the inside with a bit of crunch on the outside. We were having roasted chicken sausage and veggies for dinner tonight (one pan deliciousness) and needed something else and these just worked splendidly. How have I not made a recipe you posted clear back in 2010 yet?! I’m sure there are some others and if you keep posting good recipes I’ll never catch up! Oh well, I’ll die trying. I just made these yesterday for a Thanksgiving meal and they turned out beautifully. Thanks for sharing the recipe! Have you ever tried using one of your amazing biscuit recipes to go on top of a chicken pot pie? I was wanting to make some sort of bread, being out and not wanting to go to the store quite yet, but i didn’t want to have to knead the bread. Then I saw this recipe! I have to say that they are absolutely amazing! Thank you so much for this recipe. I made them today using a batch of my organic home milled flour, in this case spelt, oat groats and buckwheat berries. I added 1/4 tsp of baking soda. They turned out fabulous. I find it disheartening that so many people are content to use all-purpose flour (so bland and tasteless) when there are so many more nutritious and flavorful grains available for baking. This is a great recipe and I will be making it again, with various flours. Thank you! Depends on the size – probably 8-12. Marvellous recipe, I just made it and the biscuits look wonderful and they test just perfict. Love it and for sure I will make it again. Made these tonight and they were very good! Added about a 1/4t garlic salt instead of salt. Some family members though they were some what bland so I’m looking for suggestions on what to add to the flour to liven it up. These look delicious and easy. I was wondering if you have had any experience baking them at a lower temperature. We are planning an ice-fishing trip this week-end and the oven in the camper that we take out on the ice can reach a maximum temp of about 325*. Can I just bake them a bit longer until they are done? I may make a batch here at home and try a few at a lower temp, but it is going to be a busy week and I don’t always accomplish what I set out to do. If anyone has tried this, I would appreciate any tips I can get. I haven’t tried it Gina but I think you could lower the temp and add a few minutes and be just fine. Made these tonight because I needed a starch for a meal. They were absolutely perfect! I used coconut oil instead of shortening. I also used the leftover shredded cheeses I had on hand (any kind) and also subbed milk + vinegar instead of buttermilk. All went well. My family ate them up! These were amazing! I put too much garlic powder in and too much butter on the top….measuring would be a good idea! But absolutely delicious! I found your recipe for these biscuits over a year ago. They are a HIT every where I take them. There hasn’t been a potluck, dinner, gathering where I’ve taken these biscuits and had leftovers! The only modification I made was using all butter and using mozzarella cheese/parmesan once. Sometimes I’ll use white whole wheat flour. Thank you for the easiest, crowd pleasing biscuit recipe! Just made these, first time EVER making biscuits. Pretty darn good! I used to be scared to make biscuits but these were Easy (with a CAPITAL E) Thanks for the recipe Mel. These were a huge hit at my Easter dinner. Wish I had made 2+ batches! Just made these go go with a pot of homemade tomato soup. YUM! I will be making these tonight–and that’s a BIG mistake. I can already tell they’re going to be addictive to me. I love anything biscuit-like. Well, guess I’ll just have to do extra bicycling and aerobics, Huh? Just happened onto your site, but it’s bookmarked now! I’m a big fan of these, YUM! Patti – about 10-12, depending on how big you make them (another commenter made upwards of 16). How many biscuits does this make? I love to read the comments of people that have tried the recipes. While all of the comments that they look good are fun. The people who have really tried them gives you a good idea how yummy they really were. Let me tell you that these biscuits are to die for, best ever! If you like garlic taste etc you will love these. Be careful though, it is hard to stop at just one! Candice – I haven’t tried that so I don’t know! Can the dough be frozen and used for another time? YUM! Made these for the first time last night! Definitely a keeper! Made these tonight and they were amazing! Super easy to make in a hurry and they turned out great. Definitely keeping them in the rotation from now on. Hi Kristina – I think these would freeze great and would fare well defrosted and heated in the microwave for a few seconds to get them warm and tender again. I was wondering if you thought these would freeze well? I’d love to make up a big batch, and freeze some so that I could just pop them out of the freezer & let them defrost on weeknights. Made these yesterday. Oh, my gosh! They were awesome. I have a similar recipe but never have been crazy about it. These were so much better. Thank you for sharing the recipe. Man, these were so good! Crispy on the outside, soft in the middle, cheesy, salty, garlicky, mmmmm. Served with the split pea soup and kale salad from your blog – those seemed like the ultimate healthy counterbalance to these biscuits. And, really, a perfect meal. Thanks Mel! Thank you for sharing this recipe. We totally loved them! It has been years since I have been to Red Lobster, but I dare say these are better. Nothing like guaranteeing you get them straight out of the oven, too. They had a nice sharp buttery, salty, garlicky bite to them. I was able to use my ice cream scoop (I love my ice cream scoop!) to drop them on the baking sheet. We ended up with 8 large biscuits. (The size helps prevent so many seconds and I can tell myself that I am only having one). They went great with our Cream of Broccoli soup. Anyway, thank you again for posting this recipe. Yours seems really close to the one I’ve tried – which was really good!! I’ll try this one out, it is probably great too! Any time “bisquick” is in the recipe, I’m fairly sure it’s not going to be great. Sorry Mel, I also forgot to ask….So that I’m not making biscuits during the party, could I make them and put them on cookie sheets and put them in the fridge a few hours before the party and then take them out and put in the oven just before we are about to eat? Just a quick question…do you think these would go well with pizza? I’m having a pizza party next week and was wondering what “bread” sticks/biscuits/etc.. to serve with it. If you think there is something else that would work better that’s on your site, what would you suggest? Thanks! and as always, LOVE your blog!!!!!! Jodie – hmmm, I guess that’s more of a personal taste question. I don’t really think biscuits go well with pizza, but having said that, I don’t think that means you shouldn’t make them! If I am looking for another side for pizza (other than fresh fruit, veggies or salad), I usually stick with breadsticks and make extra pizza sauce, warm it up and offer it as a dipping sauce. If you do make the biscuits, I think making them ahead of time, refrigerating and baking should work just fine! I just made these right now and they are heavenly- thanks for another great recipe! Luv2cook – you can definitely try using more butter. I haven’t tried it but it should work fine (you might have to keep your eye on the texture of the biscuits – adding more or less flour as needed). These are so great! I made them with a chopped jalepeno. They turned out amazing. I will definitely save this recipe. Thank you so much! Thanks! I made the biscuits this evening. I didn’t have enough butter for the topping, but they were fantastic even without it. Light and fluffy, just like you said! The recipe is a little confusing – so there are 3 Tbsp. of butter in the biscuts, and also 3 Tbps. of butter for the topping? Hi Kelley – yes, there are three tablespoons butter in the biscuit recipe and then an additional three tablespoons in the topping (all the topping ingredients are listed together in the recipe instructions). This is our favorite biscuit we love them with spaghetti. Thanks Mel. These were SO quick to make, I couldn’t believe I hadn’t tried anything like this before. And they were delicious. I didn’t have herbs for the topping or buscuit so I did without, still good. I’m not much of a cook but love to try new things for my family. I just made my first attempt at these last night and to my surprise they turned out very good! My whole family loved them. Thank you so much for posting this recipe. Thanks, Dawn! I’m guessing you are a much better cook than you give yourself credit for – so glad these turned out! When I make these, I always make a bit extra of the butter/herb mixture. I put it right on the table to brush extra goodness on the insides of the biscuit too. Yummy! I’m new to your website — so far very excited to try some of your delicious looking recipies. I have always loved to cook good meals and have a large family. I look forward to trying your recipies and good ideas. Bonnie – thanks for your comment! I’m so glad you liked this recipe – what a delicious dinner with pasta salad. I’m also grateful you included your variations – sounds delicious! Thank you so much for posting all of your recipes, they have really added a lot to our weekly menus over here. I loved this recipe, we had it with a pasta salad tonight. Perfect addition! I added 1 cup cheddar cheese and 1/4 cup swiss, I think it added just enough of a “sour” taste to the biscuits. We will definitely make these again!! hayley – wow, I’m so glad these were such a hit! Thanks for letting me know. I’m thrilled you and your family liked them so much. Don’t worry about it, I figured them out. Mine may have been smaller because I made like 16 or something, but they were perfection. I made them for my whole family and we all fought over the last one. My absolute favorite thing of yours I’ve tried (and I’ve tried a lot)! They were just perfect. I served them with your casserole and that was perfect too. My family was in heaven! Thanks! hayley, I’m sure this is too late, but this makes about 10-ish biscuits. I mound a big spoonful, probably a couple tablespoonfuls for each biscuit. Hope they worked out for you! And how big should I make the drops? I’m making these tonight along with your cordon blue casserole. I’m sure they both will be delish! Grace – I haven’t had the Red Lobster variety in a long time. These are definitely a bit lighter – and probably don’t have quite that “zing” that the R.L. biscuits have…but they are still might tasty in my book. Guess I need to go to my local R.L. and do a side-by-side taste test. Now that would be fun. Erika, yes, I would just substitute butter for the shortening. Oh My these sound fabulous! I’m bookmarking them right now! These are going to be perfect with the roasted chicken I have in the crockpot right now. Thanks for the timely suggestion!!! I was wondering the same thing as Grace above. They look amazing. I’m bookmarking the recipe. These are my favorite kind of biscuits, I use the exact same recipe. Except I guild the lily so to speak and make a garlic butter spiked with Lemon juice and brush the tops when I take them out of the oven. The lemon amps up the cheese and garlic flavors and gives it a little tiny bit of tang, the one thing that seems to be missing from most RLobster copycat recipes. I’m going to try these. I’ve tried other recipes but they never live up to what I expect. These look pretty too! These look fabulous- so much better then the ones made with Bisquick! Hi there, these look so yummy! Question tho, I don’t have shortening. If you were going to substitute would you just use an extra 2T of butter? 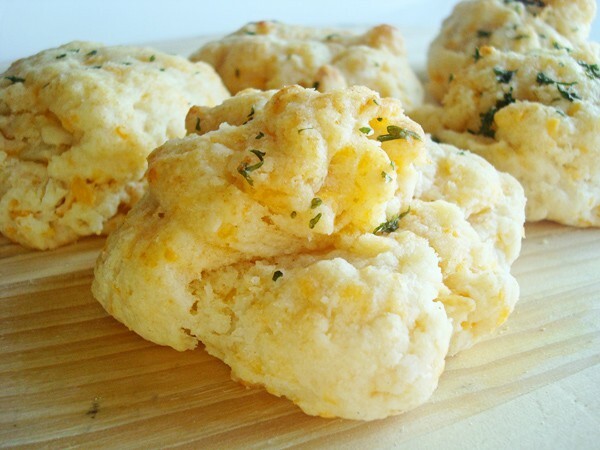 Mmmm…drop biscuits with cheeese. They look wonderful!